FREE CONTEST CUSTOM ACTION FIGURE GIVEAWAY CAPTAIN MARVEL and MAR-VELL STAR-FORCE 3.75” 2 pack MARVEL UNIVERSE by MONSTERMASH CUSTOM ACTION FIGURES!! Make sure to vote! Leave a comment below the voting page to get a shot at winning th set! 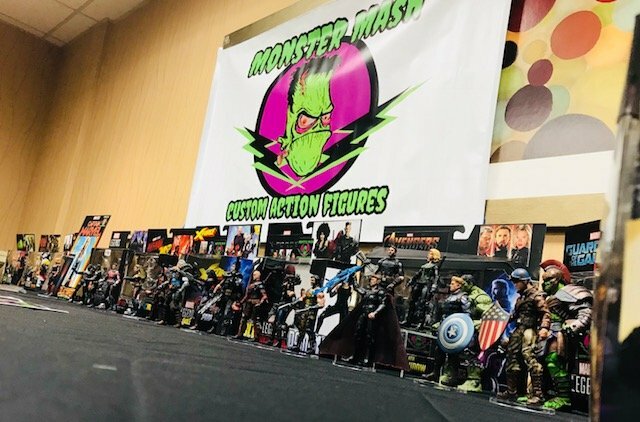 ENTER TO WIN FREE GIVEAWAY OF CUSTOM CAPTAIN MARVEL and MAR-VELL 3.75” MARVEL UNIVERSE 2pack by MONSTERMASH CUSTOM ACTION FIGURES!!!! Here is how you win: Vote for MonsterMash custom Action Figures on Toynewsi’s voting page: https://forums.toynewsi.com/forums/topic/2102238-final-round-voting-action-figure-customizer-of-the-year/ Leave a creative awesome comment and MonsterMash will select a lucky WINNER at the end of the poll on February 3rd. The Star Force Captain Marvel was made from a Black Widow vase figure with custom sculpted parts and paint. The Star Force Mar-Vell was made from a Falcon body and Steve Rodgers head with additional sculpted parts. The figures are fully poseable. A great addition to your 3.75” collection! Check out MonsterMash Custom Action Figures on Facebook: https://m.facebook.com/monstermashcaf/?ref=bookmarks MonsterMash has several new Action Figure Sets coming online this month! Very Excited to see who wins! Thank you!! Thank you. I agree about the show. A movie would be pretty cool too. it was a commission piece I did for someone.....villains coming soon. Custom 3.75" Marvel Universe Punisher vs Jigsaw 2 pack action figure set. Each figure is fully posable and comes with a variety of weapons. Punisher's base figure was made from various GI Joe Parts, a resculpted Thor head and he also has a swappable Skull Paint head. The Skull is sculpted on to the body and not just a paint job over the base figure. He has a trench coat, 2 pistols, knife, and baseball bat to knock heads in. Jigsaw's base body was from a Captain America figure. The Skull is also sculpted. His head was a total sculp job to give the grisly likeness of the character. Jigsaw come with two machine guns, a pistol and wicked blade for butchering his prey. Thank you for viewing. Follow our page on FB at MonsterMash Custom Action Figures. We will be doing an end of the year giveaway. marvel universe. marvel legends. punisher. action figures. custom action figures. Custom Avengers Infinity War Captain America, Black Widow, and Thor 3 Pack 3 3/4" by Monster Mash Customs. Custom X-Force Comic Version Cable, Domino, and Deadpool by MonsterMash Custom Action Figures. Custom Marvel Universe 3.75" Iron Fist vs Steel Serpent. Made with various parts from GI Joe, Marvel Universe and hand sculpting. This is complete with custom packaging. Iron Fist has a swappable Danny Rand head and fire effects that attach to his hands. Figures are 100% articulated. Thanks for looking. Please visit our page at Monster Mash Custom Action Figures on Facebook. More two pack figures are in the works....Thanks for looking. Repackaged, Sculpted and painted with love.....check out our page on Facebook at Monstermash custom action figures! !